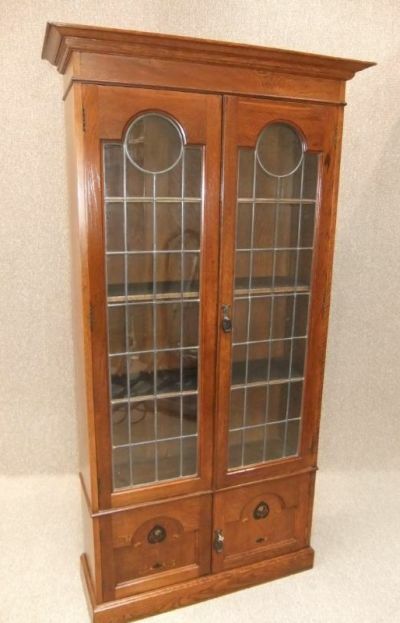 A truly magnificent piece of solid Oak, Arts and Crafts furniture. This beautiful bookcase comprises of an out swept cornice, and two leaded glazed doors which open up to reveal three fully adjustable internal shelves. This is positioned above a double door cupboard; the doors being heavily inlaid with exotic timbers in an arts and crafts design. This piece is in beautiful condition for its age, circa 1900, and would make a charming addition to any home office or study etc. Sadly, we do not have the key for the main door, and the internal slide bolt for the bottom cupboard doors are missing, but these can easily be replaced.